I think it depends on how severe the sprain is, and how things were before the injury. We know Yuzu's ankle is in bad shape. It's likely that, when he was younger, Yuzu could go back training after little rest, but the repeated strain and added injuries lead to current situation where it takes little to have damage and a lot to heal. I think last season Yuzu also had bone inflammation and he said that his bones have basically no protection because...almost no ligament left so again it's likely that he can have further issues, hence longer time to recover. But in this particular instance, I wonder if Shoma's team hasn't overestimated his ability to recover. What are the chances of a normal, healthy ankle spraining so many times in one month? Is it normal for skaters? ETA: ngl, one petty corner of my mind wonders if there is gonna be as much public outcry about this as about Rostelecom18. "Why is it so important to fly across the globe to compete here when he could have just stayed in Japan and treat the injury?" No spots at stake, contrary to Worlds18 (or Nats), and I am unaware of any special meaning of competing in USA. Plus "Worlds in Japan in little more than a month!" And "isn't this a bad example for younger skaters?" Well, I have supported Yuzu, I have supported Wakaba, and Misha, I support Shoma. It's his choice, I might worry or not understand his reasons but I won't dictate what he has to do. On the other side, I don't like to see skaters burned at the stake for their own free choices, so I hope there won't be such outcry. But then, sure as heck I'm gonna file this episode in my Archive of double standards and bring it out next time someone say Yuzu is selfish or a bad example or that his injuries are his own fault. 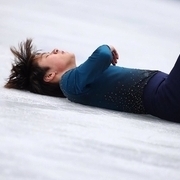 i’m legit scared for shoma yes i like his skating a lot and it’s always cool to see him compete but he should be focusing on recovering or he’s gonna struggle with his ankle. wish him the best in the comp! This! From some of the things he's said in interviews during GP season, I can tell that Shoma's been putting a lot more pressure on himself to succeed, but competing while injured might not be the way. It's very worrying. Shoma do you want to last until Beijing? Tbh, I feel like 2022 is going to be determined by who can keep their body together the longest, not who can push the technical envelope the most. The quad revolution is only really a few years old...I’m starting to worry we’re beginning to see its true toll. Depressing. I hope he isn’t pushing himself too hard because of public chatter. He’s not very outwardly expressive, so it’s easy to think that negative things said about him don’t affect him much. Tbh, I’m also having a hard time understanding what’s so important about 4CC in Anaheim that he’s putting himself through this, which makes me worried that feels like he has something to prove to the point of disregarding his own health. Are there reports on Boyang’s condition? My prediction: Vincent will win SP (unless he bomb, lol). Nah. I have faith in Shin. You think so? He is only an assistant. It is SO easy to ignore his marks on jumps. Isn't the assistant one of the 3 people on the panel that gets to vote on calls? People were saying earlier that even when he wasn't the head caller the other 2 referred to his notes. I figure for him to get his way often enough for it to be noticeable when he's on the panel that he must be an influential presence. Crossing my fingers that's true.